Join us for a sundowner drive - the best sunset in Namibia - and stay for the stars in one of the darkest night skies in the world. 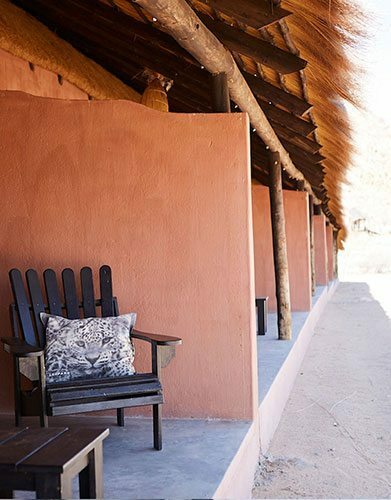 This remote settlement, at the edge of the Namib-Naukluft National Park, has been a welcome stopover for more than 60 years. 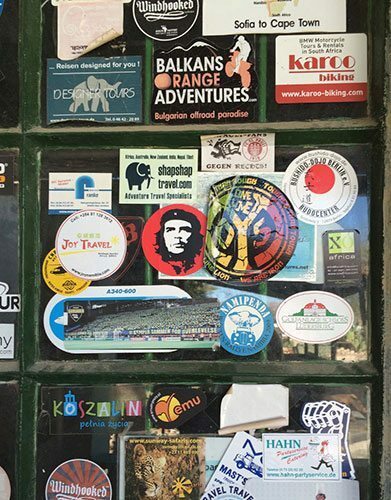 A thirsty traveler will find cold drinks, ice cream, baked goods, coffee and lunch. 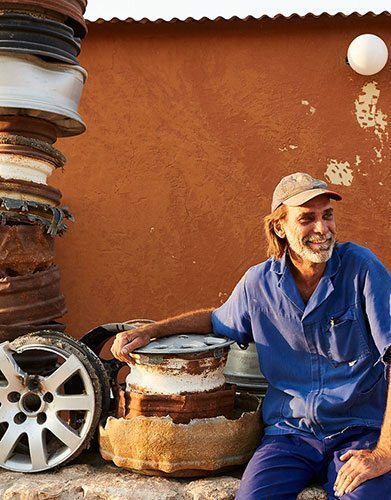 You can fill up on petrol, have tyres repaired, and stretch your legs during the long drive from Sessriem to Swakopmund. There are also 2 popular lodges for overnight guests. The Namib-Naukluft area includes Kuiseb Canyon, spectacular Spreetshoogte Pass and Namibia’s Sossusvlei dunes. 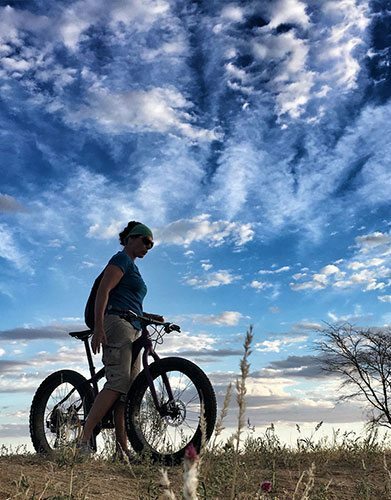 One can explore thousands of acres of Namib desert, grasslands, and rocky foothills on mapped hiking trails, fat tire bikes, scenic drives and by hot-air balloon. Solitaire sits just below the Tropic of Capricorn at the center of the 45,000 acre Solitaire Land Trust, dedicated to preserving the grassland ecosystem and the wild animals that reside here. Land Trust holdings reach from the base of the Great African Escarpment to the Namib, the oldest desert in the world. McGregor’s Bakery, Tsondab General Dealer, Lunch and Dinner at Cafe van der Lee, plus the only petrol stop between Sossusvlei and Swakopmund. 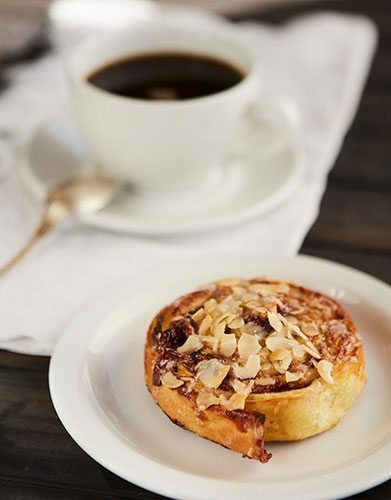 Enjoy fresh baked goods and espresso, our famous apple pie, plus take-away sandwiches and cold drinks at McGregor's Bakery. 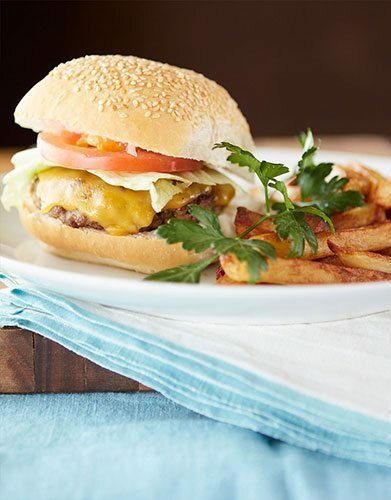 We're open daily for lunch and dinner at Cafe van der Lee, serving burgers, salads, fresh pizza, fish & chips, and specials with cold draft beer and fine South African wines. You'll find ice, snacks, water, sodas, beer, and a nice selection of wine from the western Cape in the Tsondab General Dealer. Plus sunscreen, hats & t-shirts, an ATM and phone recharge time. The Namib Desert is hard on automobiles. 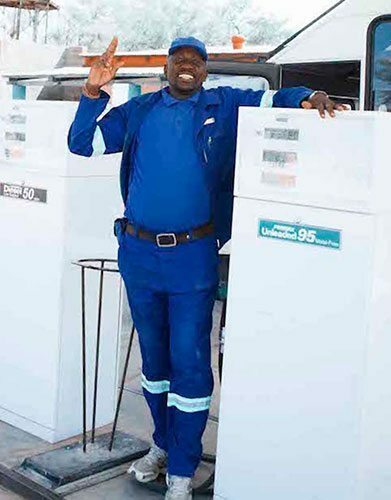 Solitaire sells petrol and diesel, and provides tyre repair and sales, oil and miscellaneous fixes. 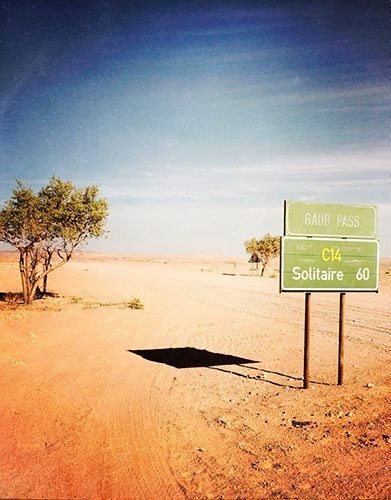 It’s the only petrol stop between Sossusvlei and Swakopmund! Just 7km from the village of Solitaire, is an award-winning lodge hidden at the base of the rugged Rand Mountains. With a maximum capacity of just 35 guests, it offers a superlative experience in nature. 14 spacious air-conditioned rooms feature en-suite bathrooms and outdoor seating areas. 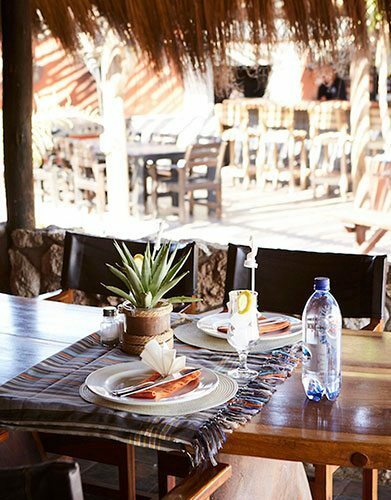 Lush desert gardens, filled with resident birds and many plant species endemic to Namibia, surround the thatch restaurant. 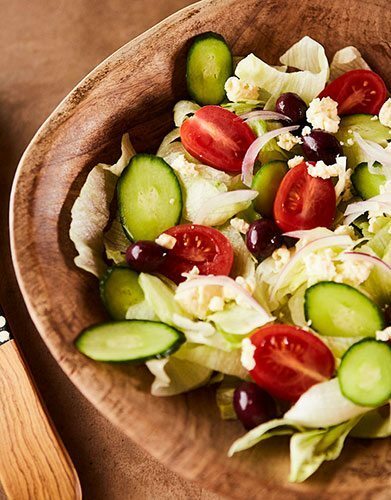 Enjoy freshly prepared cuisine and select South African wines every night while gazing on the Namib’s spectacular night sky from the outdoor terrace. Whether intent on idleness or activity, swimming, hiking, hot-air balloon flights and scenic drives are always available. There is a free shuttle by prior arrangement for fly-in guests landing at the Solitaire air strip. Limited camping is available by reservation. 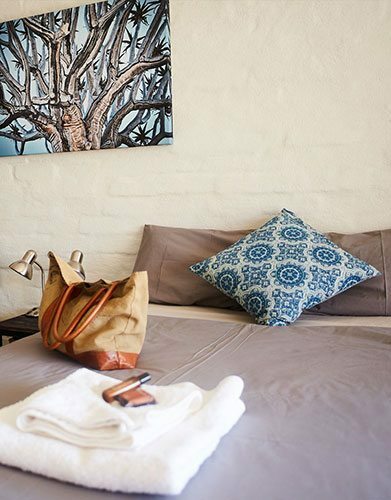 Our 25 spacious rooms wrap around a courtyard pool and delightful desert garden. 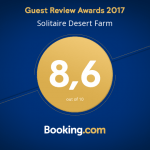 All rooms are fully air-conditioned and feature two double beds, en-suite bathroom with shower, and an outdoor seating area. Our two family rooms each include two additional twin beds, sleeping up to 6 persons. There is free WIFI at various points across the property. 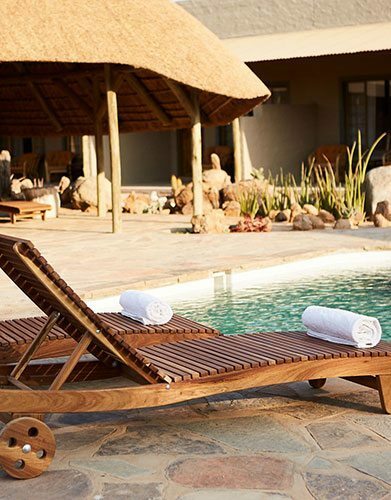 Shaded thatch lapas invite lounging by the pool, while a slate of adventurous activities await the more energetic visitor. Guests enjoy breakfast and dinner at Cafe van der Lee and can watch the sunset from our open-air bar. Sit back and relax as this historic little village becomes a quiet, star-filled oasis after dark. At the end of the day, hop in a classic Land Rover for a Scenic Sundowner. 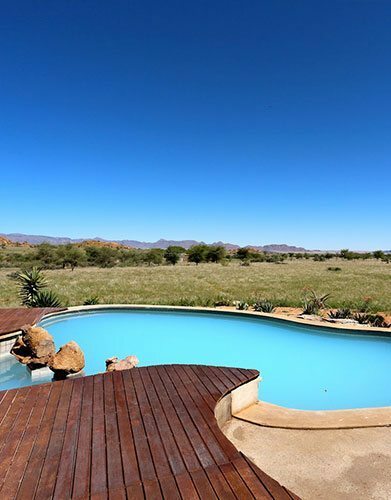 On an overlook point with a spectacular sunset view of the Namib Desert, you'll have snacks and Cold Drinks. Warm Namibian hospitality included. You can see the Namib-Naukluft from above with Samawati’s fantastic hot air ballooning. Lodge guests are invited to hike in the foothills on marked trails created for all levels of fitness, and our farm roads are great fun for walking and mountain biking. The Cheetah Sanctuary is a home to animals who, unfortunately, cannot be released. 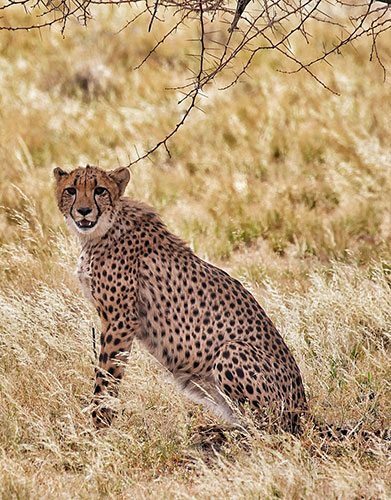 We offer a guided tour to observe and learn more about these beautiful cats and cheetah conservation. There is a four-person minimum and reservations are required. Overnight guests can take a free breakfast pack for an early-departure day trip to Sossusvlei and its famous dunes.  There are also excellent self-drive day excursions from Solitaire including Spreetshoogte Pass and Kuiseb Canyon. 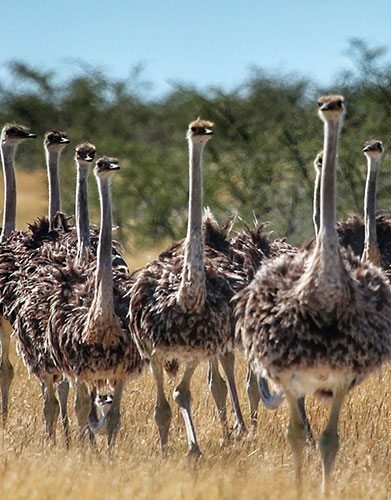 The Solitaire Land Trust is a Landscape-Level conservation project currently protecting 45,000 acres of semi-arid grassland habitat between the Great African Escarpment and the eastern edge of the Namib desert. This ancient ecosystem is home to protected and endangered plant and animal species that have evolved over countless millennia to survive in a dry and difficult habitat. This sparsely populated area, unsuitable for agriculture, is adjacent to one of the largest game parks in Africa, the Namib-Naukluft National Park. The park, however scenic, is mostly rocks, sand dunes and gravel plains. Critical grasslands and watersheds to the east are largely on fenced-off, private property. Ungulates require the ability to move freely in search of grazing and water. Our keystone species, like cheetah, require healthy prey populations to exist in this harsh ecosystem. As climate change intensifies, the age of the Anthropocene will call for many more unimpeded tracts of productive land to support an intertwined web of wild animals and prevent their extinction. Even common species may experience population crashes under the pressure of a warming climate and habitat loss. The village of Solitaire is the funding vehicle for our conservation projects. Every cup of coffee, every piece of apple pie purchased, contributes to conservation. We believe that sustainable tourism supports conservation, not only by allowing us to revitalize the landscape and restore its biodiversity, but through job creation and training in tourism and science, giving all citizens a stake in the future of a healthy Namib. Since taking over management in 2015, we have achieved a 50% savings in water usage through xeriscaping, infrastructure repair and conservation. We are in the planning stages of a water recycling project that will serve all our irrigation needs. We’re currently building a solar park to provide 50% of our daytime power needs. The mass tourism industry demands air conditioning in lodge rooms, even here, in this remote and ancient desert. It’s a policy we struggle with, and try to ameliorate its negative effects on the environment through improved building practices and closely managing power usage. Let’s all turn down the lights! In our quest for a return to dark skies, we’ve removed 40% of existing light fixtures and reduced wattage in what remains. Our goal is to have no floodlights and no unshielded bulbs by 2019. Western Namibia is blessed with one of the darkest night skies in the world. Pollution from artificial light interferes with our ability to see the dazzling natural night sky, and negatively impacts the normal functioning of nocturnal species. We recycle refuse that was previously burned or simply dumped in the desert; 20 tons were sent to a recycling facility last year, and 10 tons of scrap metal was removed for recycling. After 60+ years of farming impact, an estimated 2 tons of scrap metal remains for processing and removal.